A route indicates the availability of content via a certain face and provides meta-information about the face. Definition at line 45 of file rib-entry.cpp. Definition at line 57 of file rib-entry.hpp. Definition at line 51 of file rib-entry.cpp. Definition at line 66 of file rib-entry.hpp. Definition at line 59 of file rib-entry.cpp. Definition at line 75 of file rib-entry.hpp. Definition at line 67 of file rib-entry.cpp. Definition at line 84 of file rib-entry.hpp. Definition at line 75 of file rib-entry.cpp. Definition at line 93 of file rib-entry.hpp. Definition at line 99 of file rib-entry.hpp. Definition at line 83 of file rib-entry.cpp. Definition at line 94 of file rib-entry.cpp. References ndn::tlv::nfd::Cost, ndn::tlv::nfd::ExpirationPeriod, ndn::tlv::nfd::FaceId, ndn::tlv::nfd::Flags, ndn::tlv::nfd::Origin, ndn::encoding::prependNonNegativeIntegerBlock(), and ndn::tlv::nfd::Route. Definition at line 124 of file rib-entry.cpp. Definition at line 140 of file rib-entry.cpp. 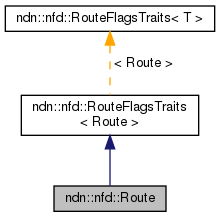 References ndn::tlv::nfd::Cost, ndn::Block::elements_begin(), ndn::Block::elements_end(), ndn::tlv::nfd::ExpirationPeriod, ndn::tlv::nfd::FaceId, ndn::tlv::nfd::Flags, nonstd::optional_lite::nullopt, ndn::tlv::nfd::Origin, ndn::Block::parse(), ndn::encoding::readNonNegativeInteger(), ndn::tlv::nfd::Route, ndn::to_string(), and ndn::Block::type().